Tom Hardy or Charlize Theron? There was some debate here about who should grace the cover of the Straight as we celebrate the year’s best movies. Honouring Mad Max: Fury Road was a no-brainer. George Miller’s visionary, operatic chase film—a merging of pulp, cinematic art, and radical cultural commentary like no other—captured the number one spot on lists ranging from the New York Times to Variety, Vanity Fair, and the Village Voice. This is an astonishing outcome for a tent-pole blockbuster released by a major Hollywood studio. But Mad Max: Fury Road is no ordinary blockbuster. At the heart of Miller’s exemplary smash-’em-up lies a stealth attack on late-stage capitalism and patriarchy, something that nobody saw coming, even if the clues embedded in the film’s prerelease poster art were glaring. Seen only in profile, the star of the film is literally muzzled. It’s Theron’s Imperator Furiosa who gazes back at us. She might have been gazing from the cover of the Georgia Straight, too, if her unmuzzled costar hadn’t brazened his way into two of 2015’s most talked-about flicks. Max Rockatansky is a broken man in search of virtue, while Hardy takes a significantly different role in The Revenant—the only film besides Mad Max and Ex Machina to appear in three of our four critics’ lists. As the ruthless John Fitzgerald, the Brit actor whips up yet another enduring weirdo: a cold-blooded, half-scalped Texan mercenary whose presence threatens to overwhelm Leonardo DiCaprio, a momma grizzly bear, and even the film’s audacious, self-imposed production tribulations. With his thundering performance as both Kray twins in Legend as another conspicuous triumph, this was clearly Hardy’s year. 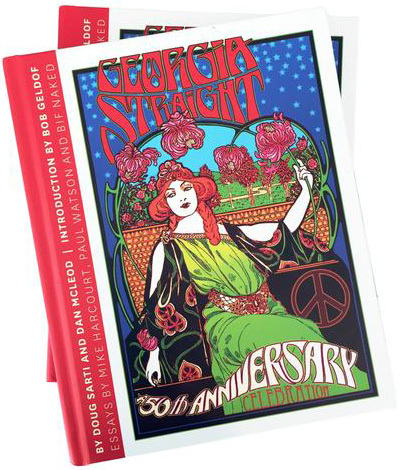 Appearing on the cover of the Georgia Straight seems almost—almost—like a relatively minor thing in comparison. This year was mostly an occasion for big concepts, with computer-enhanced journeys into space, the past, pure fantasy, or all of the above. This generally involved shooting things—rockets, guns, missiles, and bombs—at other people and places. The destructive impulses of ostensibly humanistic filmmakers can forever be attributed to inner complexity and the desire to reach a mass audience. But is there a point at which we’ll get sick of seeing men, and the odd Charlize Theron, draw weapons to solve (i.e., perpetuate) every conflict? There are few guns in the movies listed below, although there are some swords, plus more than one victim of prejudice, wit, or their own worst impulses. A young woman discovers a true sense of self while battling convention in 1952 New York. That description works for both of these exemplary character studies, which set finely modulated, largely female performances against obliquely filmed period backdrops. Irish director John Crowley was originally set to direct Cate Blanchett and Rooney Mara as troubled lovers in Carol, but stylish Todd Haynes got that honour, and Crowley ended up with Brooklyn’s Soairse Ronan, who won’t have to compete against a costar at Oscar time. The year’s most unusual movie (if you count January as an honorary part of 2015) is actually a stop-motion animated feature not suitable for children. Charlie Kaufman’s script, developed as a radio play, uses only three voices to explicate a variety of troubled personalities, centring on David Thewlis as a self-help guru in serious need of his own salvation. You don’t have to be a journalist to pine for the days (say, about 15 years ago) when investigative print reporters could take down corrupt governments, crooked businessmen, and—in this case—pedophiles protected by the Catholic establishment. Michael Keaton heads a large, uniformly good cast that sticks to naturalistic performances in a procedural drama that avoids sensation and lets its subject provide the intensity. This offbeat feast for cinephiles throws the sick-teen subgenre on its ear with the multidisciplinary tale of an odd high-schooler whose filmmaking obsession both obscures and explicates the intrusions of real life. Marielle Heller’s writing-directing debut stars England’s Bel Powley as a 1970s San Franciscan who unapologetically steals her mother’s boyfriend. Heller’s nonjudgmental script clicks with a style, like Me and Earl’s, that draws on graphic-novel aesthetics. Are robots our friends, or even potential lovers? Sweden’s Alicia Vikander breaks through as a seductive cyborg in this tale of near-future tech evolution (making up for her dud turn in The Danish Girl). Despite a bifurcated structure, with perfect Paul Dano alternating with iffier John Cusack as head Beach Boy Brian Wilson, the colour-rich film offers coherently profound insights into the creative process, whether making music for the moment or, in this case, the ages. Not even Taiwanese master Hou Hsiao-hsien could likely explain the circuitous plot of his gorgeously fragmented genre tale, a Tang-dynasty saga turned into a series of unforgettable images that manage to riff on almost every type of cinema, and on the notion of storytelling itself. In which Laurie Anderson illustrates how it’s possible to make a documentary that is both deeply personal and confidently abstract enough to engage viewers who don’t know her work or life. Other musical docs that killed this year include the stylish Amy, recalling tragic singer Amy Winehouse, and the joyful Mavis!, celebrating the most famous of the singing Staples. Mad Max: Fury Road ’s Charlize Theron. Directors in 2015 upended genres the way Mad Max: Fury Road flipped cars. Everything from westerns to sci-fi flicks to chase movies got a reboot. And then there was that disastrous new take on horror—Brangelina’s By the Sea. Cool visual polish meets deep, disturbing ideas about artificial intelligence in Alex Garland’s stunning directorial debut. Alicia Vikander brings sinister grace and vulnerability to her metal-encased creature, while Oscar Isaac is brilliant as her enigmatic tech-guru maker. George Miller cranks up the hyperstylized, postapocalyptic mayhem for the new millennium in a chase movie so unrelenting that you need a roll bar to watch it. The miles of lifeless desert sand and the turbocharged deathmobiles make for a ride that’s brutal, badass, and goddamn beautiful. The feminist ambitions are the unexpected bonus. Alejandro González Iñárritu serves up his western-survival tale’s barbarity in 360 degrees, shooting in long takes that immerse you in the blood and chaos. A revenge epic that rethinks cinema as much as it does Hollywood’s version of frontier history. A devil with blue-glowing e-cigarettes and Rolexes, Michael Shannon’s real-estate agent is the villain of the year in a film that smartly exposes the human cost of the subprime-mortgage fiasco. Try not to squirm at the sight of evicted homeowners having their lives thrown literally to the curb—a humiliation several million endured. The brain-melting banking machinations that led to the recession play out as manic black comedy—complete with a star turn by a raging Steve Carrell and tongue-in-cheek trading-lingo lessons by the likes of Selena Gomez and Anthony Bourdain. And hey: what other film this year taught you what a CDO is? A moving inside look at life in Paris’s banlieues (housing-project ’hoods), where there are few ways out for girls, and most of them are bad. An urgent, empathetic exploration of race, gender, and poverty amid France’s urban sprawl. Cinematographer Roger Deakins’s wide shots of endless desert and bleak cityscapes heighten the sense of doom in the best movie about the morally murky U.S.–Mexico drug battles since Traffic. Watch it in a double bill with the documentary Cartel Land to feel even more outraged about America’s never-ending war on drugs. Even though it soft-pedals the more unsavoury aspects of N.W.A’s story, Straight Outta Compton channels the raw, supercharged energy of gangsta rap’s explosive beginnings. Big props for offering a rare, and sadly still timely, window onto the American racial-war zone that gave birth to Dr. Dre, Ice Cube, and Eazy-muthafuckin’-E.
A stunning array of found footage helps piece together an unsettling portrait of fame’s ravaging effects on Amy Winehouse, a singer as damaged as she was insanely talented. Much more than a luminous slide show of Sebastião Salgado’s mind-blowing photographs of human suffering and endangered landscapes, the documentary gives the visionary artist’s remarkable life story a fittingly artful treatment, care of Wim Wenders and Salgado’s son, Juliano. Straight Outta Compton ’s Jason Mitchell. Shooting with puppets to heighten the distance between actions and feelings, Charlie Kaufman autopsies the rationalizations of an inspirational speaker who uses his facile insights primarily as a tool for self-gratification. Not fun, but quite possibly a cinematic landmark. An audacious film experiment that combines zany character comedy with a public-service agenda, to explain the financial crash of 2008 to people who didn’t understand it, e.g., me. The movie embraces its pedantic side while somehow creating real emotions, primarily horror and anger. The biggest surprise of this year is that we actually needed another Rocky sequel. Ryan Coogler writes and directs the story of a kid driven to match the legacy of a father he can never know, except through his father’s greatest rival and best friend. It’s an absorbing drama and also an amazing fight film. Tense, smart science fiction that sort of asks what it means to be human, when it is really asking, what is wrong with guys? Alicia Vikander, having a fantastic year (she was also in The Danish Girl and The Man From U.N.C.L.E., and she has Michael Fassbender for arm candy), stuns as a character who is more than the sum of her parts. Superficially a high-gloss tribute to spy movies, Kingsmen is also a vicious mockery of James Bond, his class values, and his violence. Featuring a church massacre set to “Free Bird”, an exploding Obama, and an instantly notorious joke ending, the movie goes too far, which is the point. As you should already know, the revived and recast Road Warrior takes a back seat, sometimes literally, to the already iconic Imperator Furiosa. The movie is achingly gorgeous even when it is frenetic, with astonishing world-building entirely embedded in the production design. If the movie has more than a hundred words of dialogue, I would be surprised. This year’s stranding of Matt Damon on a planet leads to the most likable movie of the year, in that there are no villains and no hate. The movie doesn’t need any extra drama, given the situation. It is a rah-rah piece for the engineering mentality at its best. A thoroughly inhospitable landscape of freezing rivers sets the tone for this spectacular tale of survival and revenge, based on the life of frontiersman Hugh Glass, whose toughness exceeds that of a Chuck Norris joke. An object lesson in how to use special effects (it was not a real bear! ), and something of a documentary of actual suffering (those are real freezing rivers!). Brilliantly shot, gifted with compelling performances, and loaded with violence that might be excessive in a slasher film were it not also so plausible in its depiction of the horrors surrounding the Mexican cartels. It is a deliberately ugly film with no hero or moral victory, but is strangely watchable and, yes, entertaining. This sleeper hit galvanized audiences with its brutally catchy soundtrack and an awareness of milieu that could not have been more relevant in this summer of #BlackLivesMatter. This biopic of N.W.A delivers as both official hagiography and stunning evocation of musical ecstasy. The thrill of creation, the agony of lousy managers, the parasites feeding upon celebrity—it’s all here, bigger and perhaps better than life. The Revenant ’s Leonardo DiCaprio. I suppose I could use this space to mention that nothing made me laugh harder this year than Adam Scott’s weenie little dink dancing with Jason Schwartzman’s overly plump dong in The Overnight, but that would be cheating. A radical blockbuster action film, financed by U.S. dollars, with the scope and intelligence to understand the primacy of gender inequality; a reboot that doesn’t take advantage of your affection or disrespect your memories; a blindingly successful marriage of cinema’s most basic language and its newest technology: Mad Max: Fury Road seems like an almost impossible thing in 2015, and yet it exists, like a sudden explosion of pristine water in a radioactive desert. These life-changing, three-hour Russian sci-fi movies are getting a little thin on the ground these days, probably because they tend to come with a body count. Indeed, director Aleksei German popped his clogs after spending roughly 43 years on this thing, an (almost) single-take journey through a medieval world of Bosch-ian horror and Escher-like complexity so completely and viscerally realized that I suspect German might have died of a little too much vision. Do whatever you can to see this agitated documentary about Steve Fonyo (like catch it at the Cinematheque for a single screening on January 16) and wonder at the astounding insight and compassion filmmaker Alan Zweig brings to a broken man terribly in need of both. You don’t so much watch Arnaud Desplechin’s ’80s-set tale of mad love as imbibe it. If you were there, if you remember the inspired buzz of youth, its vast promise and wanton embrace of danger, and if you still wonder how it all, inevitably, went wrong—this one’s for you. Like Kenneth Anger remodelled as an impish, gentlemanly Brit, Peter de Rome made movies—actually, it was more like a joyful, erudite form of diary—in an era of clandestine, heavily coded encounters. That defiant thrill seeps into every inch of his canon (oooer, missus! ), as does the excitement of New York in the ’60s and ’70s, all of it without a whiff of exploitation. Weirdly uplifting. Very weirdly uplifting. Pretty much perfect, Inside Out takes the fraught, painful process of individuation and turns it into the most amusing, touching, and elegant kids’ entertainment since Up. It also makes a very reasonable argument for Pixar as your new therapist. True story: in 1976, my dad was taunted and chased by six fully made-up clowns driving a long black sedan. And kids were disappearing all over the place in the sun-bleached, Up With People ’80s. These were strange, haunted times, vividly remembered to unsettling but never obvious effect in Philippe Lesage’s remarkable feature debut. All of Birdman’s hollow trickery is repurposed to unforgettable effect in Alejandro González Iñárritu’s already mythically tough, bleaker-than-bleak 19th-century revenge opera. Maybe this one spoke to me because I’m not a neurotic American actor and I hate Canadian winters? The Act of Killing pushed high-concept documentary filmmaking to nauseating extremes. This quasi-sequel speaks more plainly, and movingly, following an Indonesian optometrist who dares, at considerable peril, to confront his brother’s killers in a country where the wounds of genocide go unhealed and justice remains in exile. Unfairly maligned and now forgotten, Paul Thomas Anderson’s film got the mushrooming, superparanoid grain of Thomas Pynchon just right, with dollops of broad vaudevillian humour and true on-screen genius in the shape of Josh Brolin’s Bigfoot Bjornsen. As with certain Kubrick movies, 10 years from now we’ll all be calling it a classic.